If you're bored at work or looking for something to read while your child busies himself attempting to stick his fingers in the electrical sockets, head on over to Laughing My Vag Off! 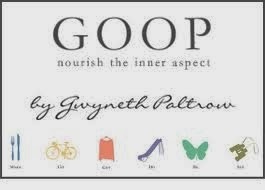 I'll be there all day discussing my irrational hatred for Gwyneth Paltrow and Goop. If you're a fan of ol' Gwynnie I suggest you refrain from clicking through, but if you're a kindred spirit I think you'll enjoy my rant. Go on, check it out. I guarantee you it's more enjoyable than de-boning an organic free-range chicken and, let's face it, probably a heck of a lot more enjoyable than boning Chris Martin (I mean, he really does seem like the type of guy who wouldn't care if you finished, am I right?). Enjoy!